Posted February 5th, 2019 by Kirti & filed under Karooya's AdWords Scripts. 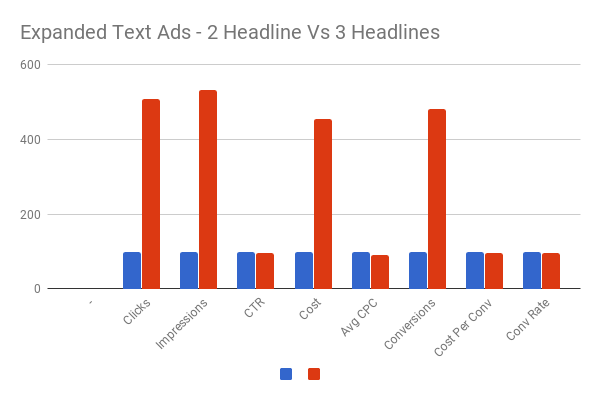 This script, when run, creates a report where you can see the cumulative data of your account that are segmented basis 3 headline and 2 headline ETAs. As you can see below, all key performance metrics such as Clicks, Impressions, CTR are mentioned for both the previous format and the new one. You can use this data to compare the performance. You can also easily find out ad groups that do not have any active 3 Headline ETAs and can rollout the ads for those ad groups. How to get this AdWords script? Here are the variables that you can change to customize it to your requirement. MAX_ADGROUPS : This report is generated for top ad groups in the account, by spend. This variable specifies number of top ad groups to be included in the report. By default, this is set to 200. That is, the report is generated for top 200 ad groups, by spend. You can increase this limit, if you are running a large account. From our experiments, we have see that it takes approximately one second to process one ad group. Increasing this limit will make the script run longer. A script can run for a maximum of 30 minutes, which means, about 2000 ad groups will be processed at a maximum. IS_MCC_ACCOUNT : This flag is to indicate whether you will be running this script at MCC-level. By default, it is set to false. Change it to “true” if you want to use for all the linked accounts in your MCC account. The results for each account will be stored in two separate sheets – one with raw data and one has the summary. Be careful, if you have many many accounts. DATE_RANGE: By default this is set to LAST_7_DAYS, however, you can use predefined ranges like LAST_30_DAYS or LAST_14_DAYS etc., depending on the duration which you think best represents account’s data. For example, if you have launched bunch of new responsive search ads 3 weeks ago, you can use data from last 7 or 14 days. By default, the script will get the data for last 14 days. Once again here is the link to the script. You can also get your hands on our AdWords Script here that analyzes your account for winning and poor performing ads. Feel free to send an email (support AT karooya.com) if you have any queries for this script.